Teaching our kids to pray is one of the most powerful tools we can give them to prepare for the ups and downs of life here on Earth. 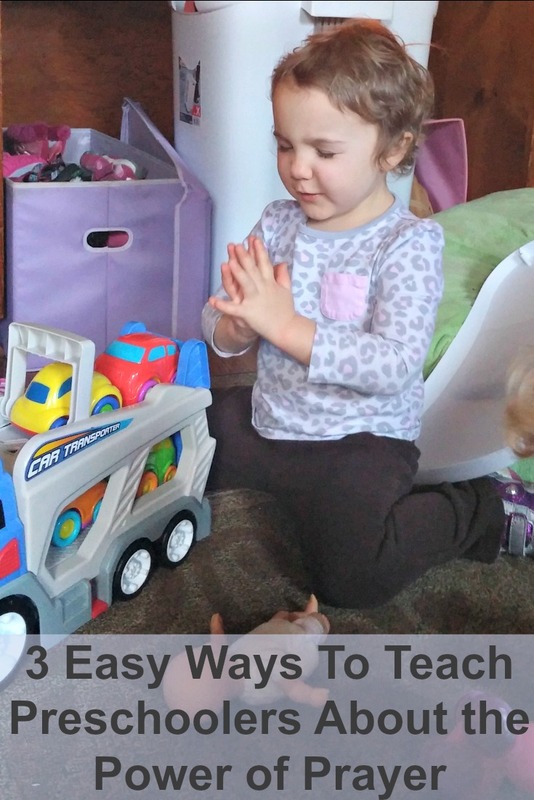 Prayer can help toddlers and preschoolers self regulate when they are upset or facing a difficult task. When the tower of blocks falls, the sippy cup leaks, or the stuffed animals won’t listen, taking a moment to help our children take a couple deep breaths and pray can take a full blown tantrum and turn it into a teachable moment. Ready? Let’s do this! *Our materials were supplied by Mother Goose Time, but I made these free printables for your convenience. Color the paper plate green like grass. Fold the paper plate in half and staple on either side to form a pocket. Use the hole punch to place holes on either side of the plate. Thread yarn through each end and tie to form a loop. Decorate the plate sides with flowers cut from the colored paper. Cut out the printable phrases and glue “Pray for Others” on one side and “Pray for Me” on the other side. Cut out the prayer request bees. 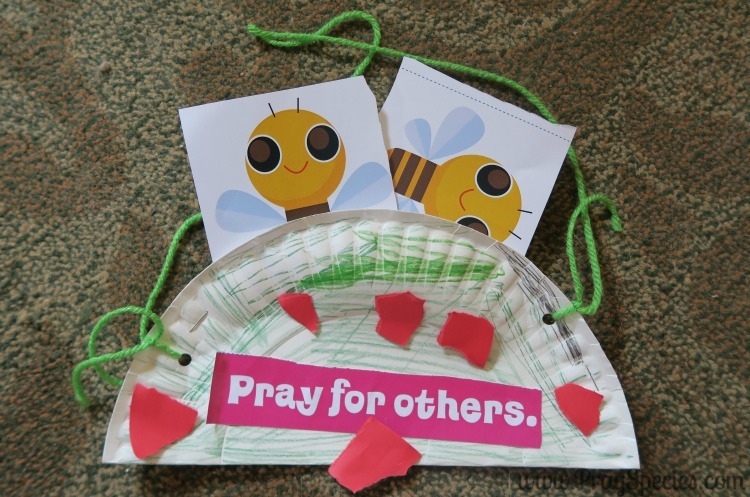 Have children volunteer prayer requests and write them on the bees. Tuck the bees in the pocket. 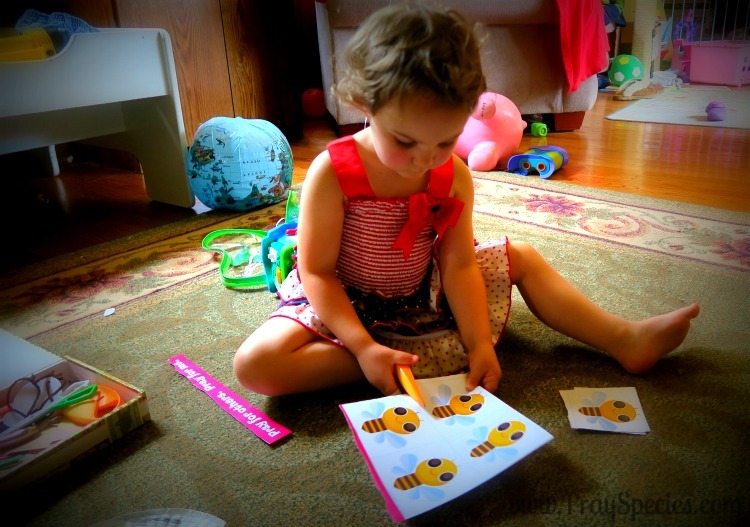 Select a bee each day to read aloud for family or group prayer. Pray for yourselves and for each other. Pray for forgiveness. God still loves you no matter what. Take a pipe cleaner and loop it around to form an eye glass shape. 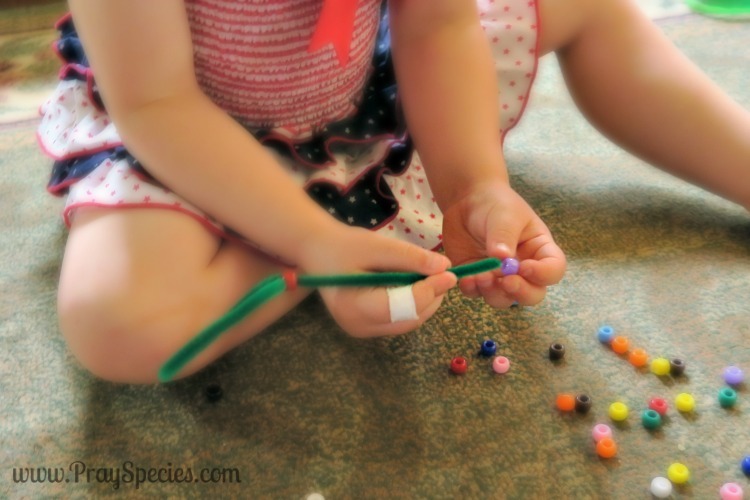 Then have children add colorful beads to the pipe cleaner formed handle. What makes this exercise powerful is the discussion you have with your children before they apply the beads. Ask your child, “When have you done something that was hurtful? When did someone hurt you? Have you ever shouted at someone? Has someone ever shouted at you? The beads represent hurts and sins. God sees all our hurts and all our sins. For each hurt or sin a child names, have them say a small prayer asking for God’s comfort or forgiveness. Then place a bead for each prayer onto the magnifying glass. If you want to make this activity even more powerful make a magnifying glass of your own and have your child give you beads for the sins you have committed and the hurts you have experienced. Keep it G rated of course, but seeing us admit wrongdoing or suffering and turning to prayer for forgiveness and comfort can send a powerful message to our children. God hears all your prayers, both big and small. Look over the prayer requests your child made for the first activity. Are there some that are pretty big prayers and others that are small? Asking God to heal their sick family member is a pretty big prayer, whereas asking Him for macaroni for lunch is a much smaller prayer. Jesus hears them all. It doesn’t matter how big or small. Head outside – one of my favorite places to commune with Jesus is right in the heart of all that he has made. 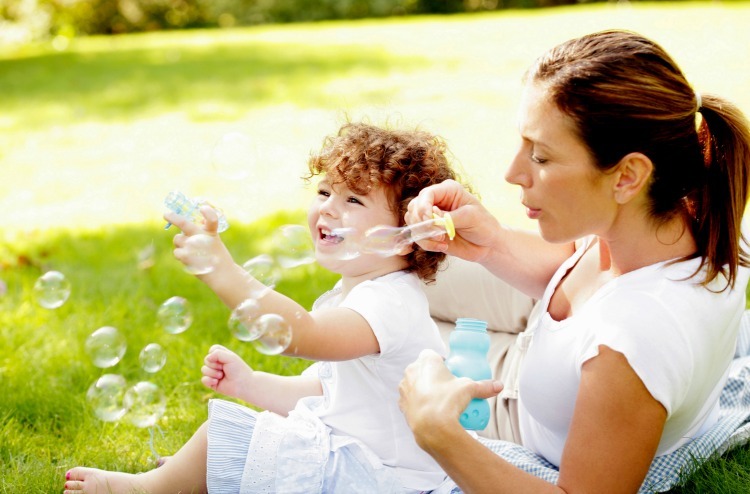 Help the kids blow some bubbles. Point out the big bubbles and the small bubbles. It doesn’t matter what size the bubbles are they all float and they all pop. Prayers are like that too. Jesus hears them all and he answers them all. Sometimes we don’t hear or understand the answer and sometimes that answer is “no.” But he hears every request you make and every word you say to him in prayer. One of the most powerful messages of the Easter season is that Jesus died for our sins. Through prayer we can ask for forgiveness, support, and understanding for ourselves and others. Even Jesus prayed on the cross. When we pray we are talking to God. 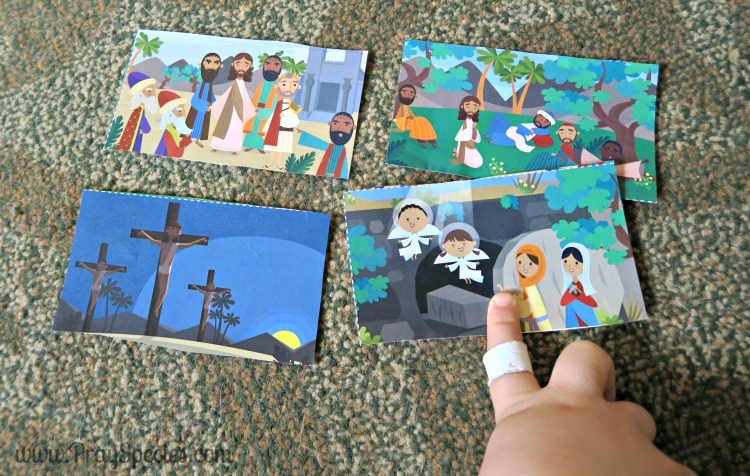 Taking time to share the Easter story with our children can be a powerful introduction to the importance of prayer. The ideas and materials that inspired this post were provided by the Experience God Preschool Christian Curriculum from Mother Goose Time. The printables included for your convenience are creations of Erika @ Pray Species. Please feel free to print them, use them, and share them, but always link to the post and not directly to the printable. Your cooperation is much appreciated! I’m love connecting with other parents who are homeschooling preschool and I’d love to hear from you! Come say hi on Facebook and Instagram or follow us Pinterest for more great ideas!